"Don't Let Me Be Misunderstood" is a song written by Bennie Benjamin, Horace Ott and Sol Marcus for the singer and pianist Nina Simone, who first recorded it in 1964. 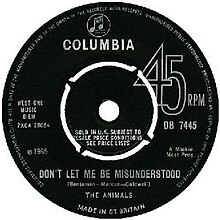 "Don't Let Me Be Misunderstood" has been covered by many artists, most notably by The Animals, whose blues rock version of the song became a transatlantic hit in 1965. A 1977 four-on-the-floor disco rearrangement by disco group Santa Esmeralda was also a hit. The beginnings of "Don't Let Me Be Misunderstood" came with composer and arranger Horace Ott, who came up with the melody and chorus lyric line after a temporary falling out with his girlfriend (and wife-to-be), Gloria Caldwell. He then brought it to writing partners Bennie Benjamin and Sol Marcus to complete. However, when it came time for songwriting credits, rules of the time prevented BMI writers (Ott) from officially collaborating with ASCAP members (the other two), so Ott instead listed Caldwell's name on the credits. "Don't Let Me Be Misunderstood" was one of five songs involving the writing of Benjamin and Marcus, presented for Nina Simone's 1964 album Broadway-Blues-Ballads. There, it is taken at a very slow tempo and arranged around harp and other orchestral elements; a backing choir appears at several points. Simone sings it in her typically difficult-to-categorize style. Horace Ott's involvement did not end with his initial songwriting; he was the arranger and orchestral conductor for the entire album. Backed with "A Monster", "Don't Let Me Be Misunderstood" was released as a single in 1964, but failed to chart. To some writers, this version of "Don't Let Me Be Misunderstood" carried the subtext of the Civil Rights Movement, that concerned much of Simone's work of the time; while to others, this was more personal, and was the song, and phrase, that best exemplified Simone's career and life. Decades later, a commercial for Christian Dior's perfume J'Adore, starring Charlize Theron, featured Simone's version of the song, as did the final scene of the 2009 Polish film drama Rewers. In 2010, Simone's version was used for the end credits of the first-season finale episode of BBC's crime drama Luther; in 2011, it was used again in the trailer for the show's second season. It was again used in the finale of the show's fifth season. In 2017, it was used again for the final scene of the pilot of FX's crime drama Snowfall. (1965) "Don't Let Me Be Misunderstood"
The Animals' lead singer Eric Burdon would later say of the song, "It was never considered pop material, but it somehow got passed on to us and we fell in love with it immediately." The Animals sped up the tempo and made prominent use of a guitar and organ riff that was picked out and expanded from an element that originally appeared in the Simone recording's outro. The song was recorded in November 1964. The group gained a trans-Atlantic hit in early 1965 from their rendition, rising to number 3 on the UK Singles Chart, number 15 on the U.S. pop singles chart, and number 4 in Canada. This single was ranked by Rolling Stone at #322 on their list of the 500 Greatest Songs of All Time. In Animals concerts at the time, the group maintained the recorded arrangement, but Burdon sometimes slowed the vocal line down to an almost spoken part, recapturing a bit of the Simone flavor. It is heard in a 2012 commercial for H&M featuring David Beckham that aired during NBC's coverage of Super Bowl XLVI on February 5, 2012. At the South by Southwest conference in 2012, Bruce Springsteen credited the song as the inspiration and the riff for his song "Badlands". A Disco version of the song by the disco group Santa Esmeralda, which took The Animals' arrangement and added some disco, flamenco and other Latin rhythm and ornamentation elements to it, also became a hit in the late 1970s. First released in summer 1977 as a 16-minute epic that took up an entire side of their Don't Let Me Be Misunderstood album, it was picked up for more worldwide distribution by the label of the time, Casablanca Records. A 12-inch club remix was extremely popular, hitting number one on the U.S. Billboard Club Play Singles chart and in some European countries as well. The single peaked at number four on the Hot Dance/Disco-Club Play chart. Released as a pop single late in the year, it did well as well, reaching number 15 on the Billboard Hot 100 by early 1978. NBC Sports would use the song frequently in the years following its release, especially during their coverage of the World Series. Santa Esmeralda's "Don't Let Me Be Misunderstood" was used as the opening theme of the 1980 pilot for the U.S. game show Bullseye, after which a sound-alike was used in regular episodes. This version of the song was also used on German ARD soccer television show Sportschau from the late 1970s to the mid-1980s, in the introduction for the "goal of the month" segment. Santa Esmeralda's rendition is featured in the 1992 film American Me and the 2001 English comedy Blow Dry. It became widely popular with a later generation after its inclusion in the 2003 Quentin Tarantino film Kill Bill: Volume 1, where its instrumental passage plays over the duel between The Bride and O-Ren Ishii, and the accompanying Kill Bill Vol. 1 Original Soundtrack, where it is incorporated in a full vocal form that runs over ten minutes. A rendition appears in the trailer for the 2005 film Kiss Kiss Bang Bang, as well as the 2008 Korean "ramyun western" film The Good, the Bad, the Weird, played in the chasing sequence in the Manchurian desert. The Animals' Eric Burdon has re-recorded the song throughout the years, notably an eight-minute version on his 1974 album Sun Secrets, and a heavy metal performance in 1976 later released on his Live at the Roxy album. Jon English recorded a version for his album, Minutes to Midnight (1977). Since the early 1980s, Burdon has performed it in a reggae style. In a different version, it was performed during The Animals' 1983 reunion, as documented on the following year's Greatest Hits Live (Rip It to Shreds) release. A version by Joe Cocker (from his 1969 debut album) played over the ending credits of the 2004 film Layer Cake. Cocker re-recorded it for his 1996 album Organic. Other artists who have recorded the song include The Moody Blues, Elvis Costello (from King of America), Cyndi Lauper (from At Last 2003; used at the final credits of one of the chapters of TV series Gypsy), Tony Moran under the moniker of Latin Rascals as vocalist and co-producer with Albert Cabrera, Arthur Brown, Uthanda, Julie Driscoll with Brian Auger, King Kong & D'Jungle Girls, Mike Batt, Trevor Rabin, No Mercy, John Legend, Lou Rawls, Gary Moore, Robben Ford, New Buffalo, Farhad Mehrad, Shahram Shabpareh, The Killers, the Doug Anthony All Stars, Di'Anno, Meshell Ndegeocello, Savage Circus, King Køng, Place of Skulls, Lana Del Rey, Regina Spektor, and Jamie Cullum. In their 1980s concerts, Dire Straits played the central theme of "Don't Let Me Be Misunderstood" during an instrumental introduction to their "Tunnel of Love", as Mark Knopfler talked about The Animals' hometown of Newcastle upon Tyne, near where the Spanish City of the song is set. Brazilian countertenor, pop and jazz singer Edson Cordeiro covered the song in his 1999 album Disco Clubbing 2 - Mestre de Cerimônia. After Cat Stevens converted to Islam and changed his name to Yusuf Islam and left popular music, various controversies arose concerning his public statements and actions. When he returned to such music, he recorded an allusion to such controversies by way of "Don't Let Me Be Misunderstood", with some lyrical alterations, as featured on his 2006 album An Other Cup. Rapper Common's "Misunderstood" sampled Nina Simone's version of her "Live in Paris" album for his 2007 album Finding Forever, while it was also sampled for the 2008 Lil Wayne album Tha Carter III, in the song "DontGetIt". The song's key lines are used as the hook of the 2012 Regina Spektor song "Oh Marcello!". Brent Smith, of the band Shinedown, has also performed a version that was featured in the trailer for the 2014 film Birdman. Lana Del Rey also covered this song for her fourth studio album Honeymoon, which was released on September 18, 2015. American singer Morgan James also covered the song on her album “Morgan James Live, A Celebration of Nina Simone.” American metalcore band Mutoid Man recorded an altered version of the song titled "The Manimals" for their 2013 EP Helium Head. Brian Newman released a version in 2018 featuring vocals from Lady Gaga as a track on his Showboat album. "Don't Let Me Be Misunderstood" by The Animals is featured as the title of Chapter 7 in the 2015 novel "Dying in June," by Amy Magness. ^ a b Hilton Valentine, "Stories", Hiltonvalentine.com, 2001-04-28. Accessed 2007-09-06. ^ a b "Songwriter, Arranger Horace Ott", www.fyicomminc.com Jazzmen. Accessed 2007-09-06. ^ Collins, Jim (July 4, 2003). "Reviews: Two-disc retrospective celebrates late, great Nina Simone". The Register-Guard. Eugene, Oregon. p. 17. ^ Margaret Busby, "Books: Don't let her be misunderstood", The Independent, 2004-04-16. Accessed 2007-09-06. ^ Rolling Stone, "The Animals", Rollingstone.com. Accessed 2007-09-06. ^ "The Animals - The Complete Animals (Line notes scanned)". Discogs. Retrieved 2017-01-31. ^ "Rolling Stone's 500 Greatest Songs of All Time". Rolling Stone. April 7, 2011. Retrieved October 1, 2015. ^ "The Animals ~ Live ~ Don't Let Me Be Misunderstood ~ 1965". YouTube. ^ "Bruce Springsteen's SXSW 2012 Keynote Speech". NPR. March 18, 2012. ^ "Santa Esmeralda - Don't Let Me Be Misunderstood". Discogs. Retrieved 2015-11-23. ^ Whitburn, Joel (2004). Hot Dance/Disco: 1974-2003. Record Research. p. 227. ^ "The Eric Burdon Band* - Sun Secrets". Discogs. Retrieved 2015-11-23. ^ "Eric Burdon - Roxy Live". Discogs. Retrieved 2015-11-23. ^ "REVIEW: Eric Burdon shouldn't be misunderstood at Penn's Peak". themorningcall.com. Retrieved 2015-11-23. ^ "The Animals - Greatest Hits Live!". Discogs. Retrieved 2015-11-23. ^ "Various - Layer Cake - Music From The Motion Picture". Discogs. Retrieved 2016-04-06. ^ "The Costello Show - Don't Let Me Be Misunderstood". Discogs. Retrieved 2015-11-23. ^ "Latin Rascals - Don't Let Me Be Misunderstood". Discogs. Retrieved 2016-10-14. ^ "Gary Moore - Don't Let Me Be Misunderstood". Discogs. Retrieved 2015-11-23. ^ "King Køng - Don't Let Me Be Misunderstood". Discogs. Retrieved 2015-11-23. ^ a b c d e Leas, Ryan (September 23, 2015). "21 Covers Of "Don't Let Me Be Misunderstood," Rated". Stereogum. Retrieved 2016-04-06. ^ Sullivan, Caroline (2012-05-24). "Regina Spektor: What We Saw from the Cheap Seats – review". The Guardian. ISSN 0261-3077. Retrieved 2016-04-06. ^ "REVIEW: Morgan James shows at Zoellner Arts Center she has the voice to do it all".